The first step to create a creepy Jack-O'-Lantern is choosing a pumpkin. Rarely do you find a pumpkin that is nearly symmetrical with no surface imperfections. Incorporate these imperfections in your design, a surface blemish is the perfect mole for a ghoulish pumpkin. To ensure that rot has not set in, grasp the stem. If the stem is not firmly attached, rotting has already begun and you should choose a different pumpkin. Generally, a large spoon, a selection of sharp knives, and a sharp utility knife are sufficient enough for pumpkin carving. Pumpkin carving kits, like those to the right, can make the job easier, safer, and faster. There are a multitude of choices to light today's Jack-O'-Lantern. There is the basic tea light, seen to the right. Besides candles, there are battery-operated lights and even strobe lights! For those less extravagant, a small flashlight will serve the same purpose. Begin by tracing a lid. A dry erase marker is ideal to use because it can be rubbed off easily after the cut is made. 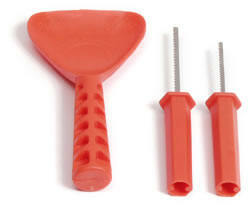 Typically, you draw a circle around the stem (which makes for a handle to remove the top). Carving a notch when drawing the circle, will make replacing the lid easier when pumpkin carving is complete. See right picture. Another option is to cut a pentagon (a polygon of five angles and five sides) or hexagon (a polygon of 6 angles and 6 sides) to serve as a lid. Cut around the outline of the lid with a utility knife or carving saw. While cutting, hold the knife/saw at an angle, this will create a cone shaped lid that will prevent the lid from falling into the pumpkin when carving is finished. Pull the stem to remove the cut lid. Depending on the thickness of the pumpkin, you may have to twist the lid to remove. Remove the pulp from the lid with a sharp utility knife. Remove the strings and seeds from the inside of the pumpkin. Save the seeds in a separate container if you plan to make roasted pumpkin seeds! See below! After all the strings and seeds have been removed, scrape the walls of the pumpkin with a spoon or pumpkin scraper. For best carving results, it is recommended that the walls are 1" thick in the area to be carved. 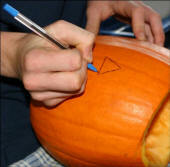 Using a dry erase marker (a good idea because it can be wiped off), outline the face of your Jack-O'-Lantern. You can also use stencils for those less creative and need some help! The stencils are attached to the pumpkin with tape or push pins. The outline is drawn with a pencil or washable marker. Now you can finally carve the face of the pumpkin with a sharpened knife or pumpkin saw to reveal your masterpiece! Insert your light source, replace the lid and enjoy! Depending on weather conditions, a carved pumpkin typically last from 1 - 7 days. There are products available on the market that can be sprayed onto your pumpkin, or that you can dip your pumpkin into. An "at home" option is to rub petroleum jelly onto all cut surfaces. 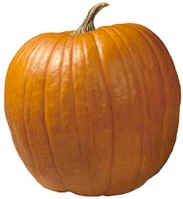 The carved pumpkin can also be sprayed with a mild mixture of household bleach and water. The bleach will kill organisms that cause rotting. Pumpkins are one of the super-foods that contribute to good health. Not only are they fun to carve, they are good to eat. Pumpkins are also low in fat, low in calories, loaded with vitamins and just plain good. Did you know? Pumpkins are 90% water. While this may seem surprising, many fruits and vegetables are largely water. And save those pumpkin seeds! Pumpkin Seeds are a super-food as well. Pumpkin seeds are rich in the amino acids alanin, glycine and glutamic acid, and also contain high amounts of zinc. Enlargement of the prostate affects about half of men over the age of 50 and including a handful of pumpkin seeds may offer some protection against the development of prostate cancer. They contain high quantities of protein, iron and phosphorous and even a tablespoon a day would be a good addition to any healthy diet.